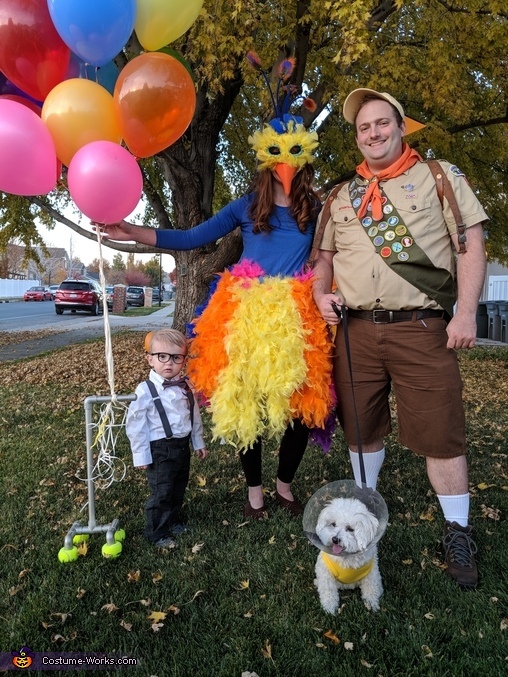 This is our little "up" family. We created our costumes piece by piece, many by hand. My husband Ryan used his scout shirt and sash from when he was a teenager, and I made his flag by hand with a wooden stick and paper. My Kevin Bird costume was just a blue dress and 9 boas strapped around my waist with velcro. My mask was a black crow mask, but I ripped off the feather and glued my own yellow and blue ones back on, painted the beak orange, and used pipe cleaner to attach the top feathers. My son Kingsley's "Carl" costume was made from regular baby clothes, with some hipster glasses! All my dog needed for "Dug" was a "cone or shame" and a shirt with a Dug quote I had made on Etsy. We created a cane with PVC pipes and spray painted it silver. It was perfect for holding out balloon bouquet too!